If you get all sorts of strange looks when you practice your super awesome lightsaber moves in public, it's probably just because you don't look enough like a real Jedi. 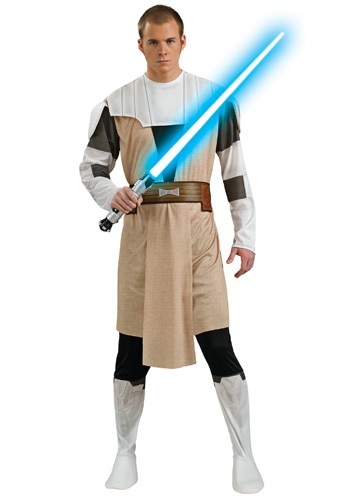 You could go the way of a giant brown robe, like the other Jedi, but sometimes when you try using Soresu Form, it gets a little cumbersome. 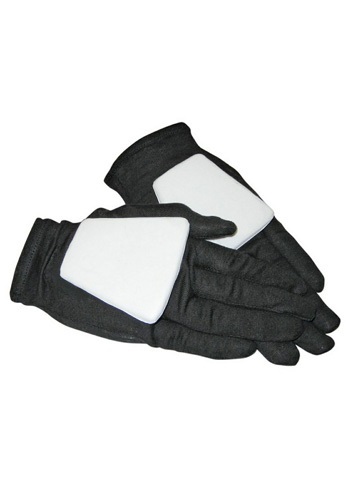 Nope, you need a set of battle gear that won't get in the way while you practice. Before Jedi master Obi Wan Kenobi took on the task of telling Luke Skywalker about the power of the force he was one of the main players in the epic Clone Wars saga. He would lead armies of clone soldiers in battle to take on the Separatist forces and challenge the likes of Count Dooku and General Grievous. 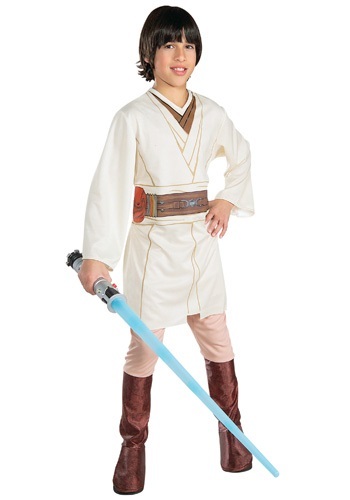 So if your little one wants to take on some bad guys in a galaxy far, far away they can in this great Obi Wan Kenobi costume straight out of Star Wars The Clone Wars. Battle droids, Count Dooku and Asajj Ventress, when can a Jedi a get break? Not during the Clone Wars, that's for sure. Even when Obi-Wan isn't locked into deadly lightsaber battles, he has to keep his old pupil from staying out of trouble. If only he could fly away to a deserted planet to get a few years to relax, away from all this craziness. There is no way that when Obi-Wan Kenobi became a Jedi that he could have guess he would take part in an epic, galactic battle. But that is exactly what he did when the Clone Wars happened. 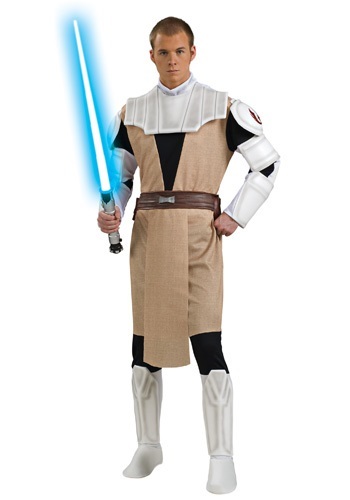 This Jedi even became a general during those battles between the separatists. 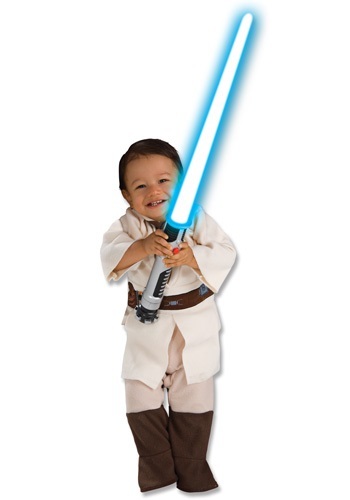 Now your little one can look like the greatest Jedi ever in this Star Wars costume. 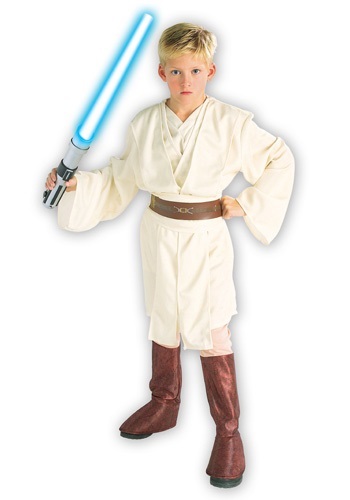 Give your little one the chance to become one of the greatest Jedi who have ever lived. Obi Wan Kenobi was trained by Yoda and Qui Gon Jinn in the ways of the Jedi order and then trained young Anakin Skywalker to learn the ways of the force. This Jedi has been across the galaxy helping out those in need and bringing down the terrible Sith Lords. But one day he'll meet a young Luke Skywalker and push him in the right direction to save the universe! "The Force will be with you, always"